This interesting surname is of Germanic origin, and has two possible interpretations. Firstly, the surname may be a topographical name for a "dweller by the hill, mound", deriving from the German "Hub(b)el", hill or mound. Topographical surnames were among the earliest created, since both natural and man-made features in the landscape provided easily recognisable distinguishing names in the small communities of the Middle Ages. Secondly, the surname may be from the German "haube", cap, hood, helmet, and would have been a metonymic occupational name for a maker of these. Job-descriptive surnames originally denoted the actual occupation of the namebearer, and later became hereditary. 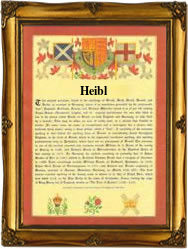 In the modern idiom the surname can be found as Haibel, Heubel, Heibl, Heibel, Haubl, Haube, Heupel and Heubel. Recordings of the surname from German Church Registers include: the christening of Christina, daughter of Walter Heubel, at Mildenau, Chemnitz, Sachsen, in 1560; the marriage of Josephus Haibel and Eva Claputh on February 8th 1695, at Schloss Zeil, Danaukreis, Wuertt; and the marriage of Margaretha Heibel and Georgius Michael Wehrle on November 5th 1736, at Herxheim, Landau, Pfalz, Bayern. The first recorded spelling of the family name is shown to be that of Fr. Heyblein, which was dated 1434, in the "Records of Neustadt", Germany, during the reign of Sigismund of Luxembourg, Holy Roman Emperor, 1410 - 1437. Surnames became necessary when governments introduced personal taxation. In England this was known as Poll Tax. Throughout the centuries, surnames in every country have continued to "develop" often leading to astonishing variants of the original spelling.